La Grenouillere (literally the 'Frog Pond') was a cafe and bathing establishment on the He de Croissy on the Seine, close to Bougival. It became extremely fashionable and popular in the 1860s, and numerous articles were devoted to the site in the press. The visitors ranged from artists and writers to aristocrats, and its prestige was finally confirmed by the visit of Napoleon III and Empress Eugenie in July 1869. Renoir painted this work in the company of Monet, who painted a scene very similar to this. In the same year they also painted another pair focusing on a different view of the location. These works of both artists mark an important stage in their progression towards the spontaneous Impressionist technique that characterize those of the 1870s. Comparison with Monet's painting of this view reveals the differing interests and approaches of the artists. Renoir took a closer viewpoint dominated by the round islet (the 'Camembert' or 'Flowerpot') as this allowed him to concentrate more on the human aspects of the scene. His figures are both more numerous and individualized, and in addition to the figures on the islet, there are rowers and sailing boats in the background. By contrast, Claude Monet's La Grenouillere shows more of the landscape, typically his prime interest, and merely suggests the form and dress of the few figures in simple, broad strokes. The highlighting in black of the structural features - footbridges, islet and cafe building-coupled with the parallel, black strokes of the water ripples, gives his work a much stronger composition. The palette of Renoir's painting is much lighter and more restricted (essentially to blues and greens) and his brushstrokes are much softer in touch. The feathery trees in the background merge almost indistinctly into the water below, giving the whole work a shallow pictorial space and serving to emphasize the figures. 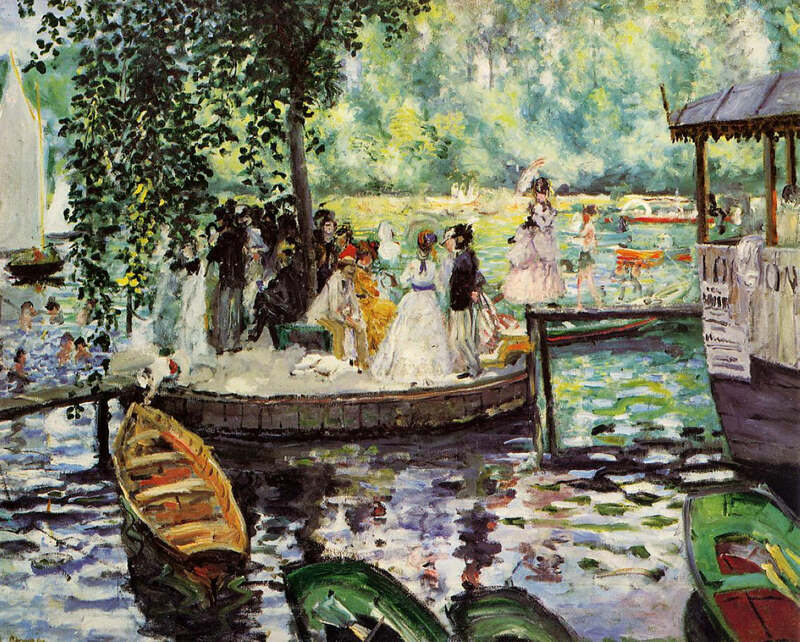 This painting, together with its companion, looks forward to Renoir's complex outdoor scenes of the 1870s and early 1880s, such as Dance at the Moulin de la Galette, and displays a new facility in dealing with themes from modern life: before this he had largely focused on a few monumental figures. The economy of the brushwork is an additional development, enabling him to capture the dress and pose of the figures with only a handful of carefully worked strokes and to indicate the water surface with broad, distinct marks. More so than in previous works, this image truly seems to capture the life and appearance of a fleeting moment.